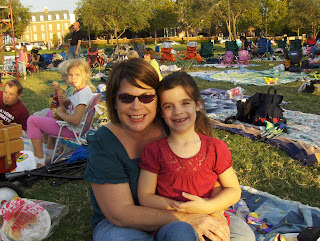 Tonight my sister Dawn invited Maddie and me to a big picnic at her work. Dawn brought her grandsons Gabe and Ryan and Kim and Kylie came also. We had a great time! There were four big inflatables, games and lots of food. 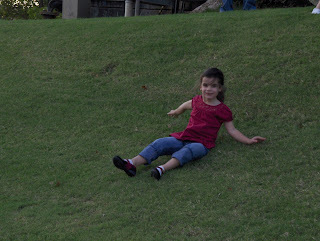 But the most fun was a hill that all the kids loved rolling down over and over! As soon as it got dark they showed the movie 'Charlotte's Web' on a GIANT outdoor screen. We only stayed for about 30 minutes of the movie but I bet it was a lot of fun watching it outside! 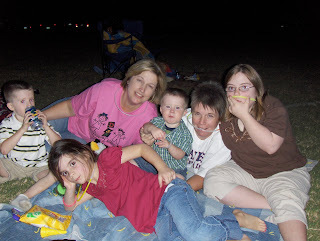 Tomorrow we'll be at the 'Buddy Walk' for all of our sweet Down Syndrome friends. I'll post some picture from that tomorrow evening. Hope you all have a great weekend! Looks like a ton of fun! I would love to do something like that with the kids. It is still so hot around here. Enjoy your Buddy Walk. I LOVE the picture of you and Maddie. You both look so pretty and happy. Glad to get the computer back and "catch up." 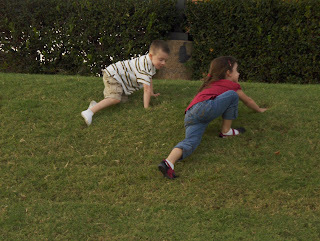 It's nice to hear you've had so much family fun time lately! Thanks for all of your posts for Ashley. Her comments have about doubled because of all the sweet bloggers asking prayer for her and that encouragement and all the prayer has helped the family so much. For me personally, it's nice to have a friend who knows a lot about what it's like. I'm excited to be back in communication again. I missed you!